The main focus during December in the Computer Lab was the Hour of Code though for most classes this was more than an hour. What did each grade do? Here’s a little peek into the action. Kindergarten students spent some time on the Planet Smeeborg helping the fuzzFamily solve mazes using the Kodable app on iPads and Android tablets. 1st Grade also used iPads and Android tablets to solve levels in The Foos app. They loved building with the Builder and growing and shrinking as the Ninja. Kindergarten and 1st Grade also did some activities about Christmas. Kindergarten heard Jan Brett’s story, The Gingerbread Baby, and then they decorated their own Gingerbread person with a few guidelines: the eyes on their Gingerbread person were to have eyes the same color as their eyes, the number of buttons were to represent their age and were triangles if the student was a boy and hearts if the student was a girl. 1st Grade heard the story of the Nativity and then drew their own Nativity scenes. Both 3rd & 4th Graders solved levels and then created their own Minecraft level (if they got that far) in the Code.org Minecraft Tutorial. Keep an eye on their portfolios once school starts back up in January because they will be updating their experience and sharing their created Minecraft adventures. 6th Grade started off the month doing some research on Computing Pioneers and Innovators. They will be finishing up some trading cards for these in January which will be shared on this blog and on the students’ Google Sites. 6th Grade then spent their Hour of Code time debugging problem programs in Scratch and documenting what they did using Google Slides. They will be sharing the process on their Google Sites in January. In addition to debugging and documenting, each time a bug was solved a bug was drawn on the whiteboard. 8th Grade also moved into text-based coding this year during the Hour of Code. They learned some Python using Trinket. They will be finishing up their posts about this in January once we are back in school and will be sharing their Python creations on their Google Sites. The Hour of Code was just a kick-off to a larger Computer Science unit that classes will be doing during the 2nd semester. 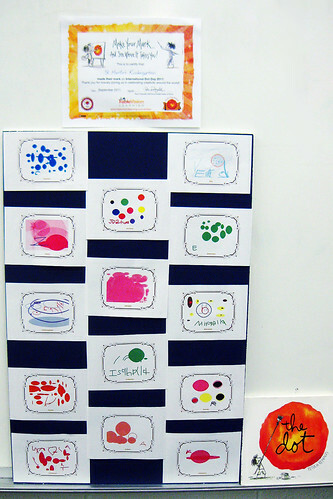 International Dot Day – Kindergarten has heard the story The Dot and are working on their very own dot pictures which we are going to bring to life using the Quiver app. 1st grade just finished their self-portraits for this year and will be sharing them in a collaborative Google Slides presentation soon. 2nd grade has finished their self-portraits for the year and will be sharing them along with some writing soon. Our 3rd graders will be working on self-portraits next week since they have only been to the lab once so far due to the Labor Day holiday and the Fall Fundraiser kickoff this week. 4th grade completed the Technology Survey for the year and is working on a spreadsheet that they will use for the year to track their keyboarding speed. This is a big task because they need to work with multiple tabs on the browser along with an Excel spreadsheet. 5th grade also completed our beginning of the year technology survey and is working on their beginning of the year keyboarding speed tests. 6th grade has also completed the beginning of the year technology survey and is working on their beginning of the year keyboarding speed tests. They have also been introduced to Google Classroom which will be used for turning in work in both the Computer Lab and their Language Arts class this year. 7th grade has also completed the beginning of the year technology survey and their beginning of the year keyboarding speed tests. They have also been introduced to Google Classroom which will be used for turning in work in both the Computer Lab and their Language Arts class this year. 8th grade has also completed the beginning of the year technology survey and their beginning of the year keyboarding speed tests. They have also been introduced to Google Classroom which will be used for turning in work in both the Computer Lab and their Language Arts class this year. Don’t forget that you can check the Computer Lab Wiki for more details on what’s happening in St. Martin’s Computer Lab. 2nd graders using Scratch? Definitely! After the Hour of Code, 2nd grade loved anything to do with coding so near the end of the year, they did a couple of projects in Scratch. We’d love to know what you think about our Scratch projects. Please leave a comment and let us know! If you’re interested in all of the Scratch projects completed by St. Martin’s students this year, you can check them out in our StM 2013-2014 Studio. 8th Grade: The 8th graders are continuing to work collaboratively on presentations about the Computer Lab Rules. They are working together in Google Documents writing scripts, raps and assigning tasks for their presentations. They will be actually giving their presentations next week. 7th Grade: To introduce MLA Formatting and review how to format a document in Microsoft Word, 7th Grade is working on a writing assignment that has them using correct formatting and their imaginations. They are describing what a day would be like if they woke up to no electronic technology – no TV, no car, no iPod, no Internet, etc. Can you imagine that? Can you imagine that if you were 12 or 13? 6th Grade: 6th Grade is also learning about MLA Formatting and setting up proper formatting in Microsoft Word. They are picking a theme song and writing a paragraph or two to explain why that song is their theme song for this school year. 5th Grade: 5th Grade was read The Important Book and talked about the format of the information in the book. They are currently creating self-portraits in Paint and will then write their own important information about themselves in Microsoft Word. 5th Grade will also learn about MLA formatting and will use this formatting for their document. 4th Grade: 4th Grade is in the middle of an All About Me project where they are creating a self-portait using Paint and then researching information about their names and they day they were born. They will be putting their portrait and the research information together into a Microsoft Word document using an MLA format. 3rd Grade: 3rd Grade finished up their self-portraits in KidPix and then spent some time exploring Jumpstart 3rd Grade. Jumpstart 3rd Grade is educational software that students will use throughout the year when they finish assignments early. 2nd Grade: 2nd Grade finished their self-portraits in KidPix and spent some time in Jumpstart 2nd Grade which is an educational software program that they will use throughout the year. They have started creating a Microsoft Word document that includes their self-portrait and an acrostic poem they are writing about themselves. They are learning how to change fonts and font sizes and how to add pictures to a Word document. 1st Grade: 1st Graders worked on their self-portraits in KidPix. When they were done with that, they used Jumpstart 1st Grade which is an educational software program they will be using throughout the year. 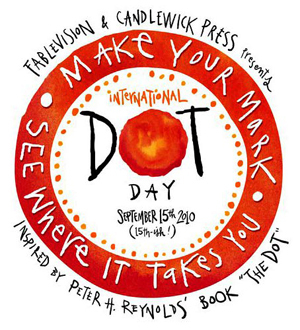 Kindergarten: Did you know that September 15th is International Dot Day? Over 13,000 students world-wide participated in this event and our Kindergarten class was part of it too. They listened to Peter Reynold’s Book, The Dot, and then learned how to draw dots in KidPix. Students then created their very own dot pictures in KidPix and signed them which is tough to do with a mouse! If you came into the Computer Lab during Back To School Night, you saw these on display but if you missed them, here are Kindergartens’ dots! The first week of school is done and the Computer Lab was already buzzing with activity. All grades reviewed the Computer Lab Rules and then had a little time to actually do something on the computers too! Kindergarten: Kindergarten students are always so excited to come to Computer class. We spent some time talking about how to hold a mouse and played on some web sites to practice moving the house and clicking the mouse. 1st Grade: 1st Grade also reviewed how to hold the mouse and click and double-click and played a few mouse games too! Do you want to play some mouse games yourself? Try your hand at the MiniMouse Games. 2nd & 3rd Grade: After the rules review, 2nd & 3rd graders jumped in to KidPix and started drawing their self-portraits. These should be done and on display in the Computer Lab for Back To School night. 4th-8th Grade: These grades spent time reviewing not only the rules but the Online Responsible Use Contract also. This is due back this week. If your child did not bring one home for you to sign or review, you can print one to sign and return. Students in these grades also took an Internet Usage Survey and I will be sharing the results of this at a Parent Internet Safety Night and on this blog. 8th Grade didn’t spend as much time talking about the rules because they are hard at work on their first assignment which is to create group presentations to tell me what each of the rules should look like in the Computer Lab. They have heard the rules every year so now it’s their turn to teach them! I will be sharing completed work in our Bizzy Bee Scrapbook and you can see more details about what each class has been doing on the Computer Lab Wiki – just click on the beehive for your child’s grade. Don’t forget to stop by the Computer Lab during Back-to-School Night if you have a Kindergarten through 5th Grade student. I’d be happy to show you where your child sits in the lab and talk to you about what we have planned for the year. Wow, September is almost over and this is the first chance that I have had to update this blog. We’re already busy in the computer lab and all grades have completed their first project of the year in honor of International Dot Day! After enjoying the book, The Dot, all students created their own dot (or dots). Dot Galleries for Kindergarten through 4th Grade are now available on the Computer Lab Wiki – you can view them individually by going to the Techno Star Scrapbook page and selecting each grade. The galleries for 5th-8th grades will be added soon! Kindergarten through 5th Grade have drawn (or are drawing) self-portraits using KidPix or Paint. Middle School is busy reviewing how to format Book Reports and Science Labs and how to create Crossword Puzzles in Excel. Starting in October, 4th through 8th Grades will be getting their very own class blogs where they will be updating what is happening in the lab themselves! For Earth Day, 2nd Grade discussed why they love the earth and things that we can do to help the earth. Each student then created original artwork using KidPix and these were added to the PlanetFesto ribbon along with their ideas of what they could do to help the earth. After this was completed, 2nd Grade used the PBS site, Eeko World which is designed to help children between the ages of 6 and 9 learn about the important role they can play in taking care of the earth. The students continued to work on their typing skills using the Dance Mat Typing site. They will continue to use this site in 3rd Grade. 2nd Grade also practiced their Money Skills on various web sites, created a Mother’s Day Wordle which I hope made it home, practiced writing paragraphs in Word and played a variety of educational games to end the year including trying out Jumpstart 3rd Grade! Next year, these students will participate in the Monster Project as well as continuing to learn about Internet Safety, Microsoft Office Products and Keyboarding. February once again brought Winter Wonderland activities for 2nd Grade. They created and recorded a Virtual Valentine and completed a Things I Love activity. The Things I Love activity gave 2nd Grade the opportunity to reinforce searching for and adding clipart to PowerPoint presentations and they also learned how to narrate a slide. All of the completed Winter Wonderland activities are shared on their Winter Wonderland page. If you haven’t seen these, you really should take a minute to check them out. 2nd Grade worked on their keyboarding skills by completing Level 1 of Dance Mat Typing. They also wrote and illustrated a short story about what would happen or what they would do if they found the pot of gold at the end of the rainbow. For this story, they used Wordpad and drew the illustration using the built in drawing tools in Wordpad. These have been printed and sent home. I hope you had an opportunity to see them. 2nd Grade also spent time using the educational program, Jumpstart 2nd Grade.